The unreleased & legendary 'Dare You To Love Me' CD by Chaka Khan would've been a gem in her discography if it were released back in 1995. This 'lost album' was completed before 'Epiphany' was released in 1996, and for some reason, Warner Brothers decided to disregard all of the hard work that Chaka (& others!!) put into the project by cancelling it's release. Warners then started to release several of the tracks on a variety of soundtracks, compilations, and others even appeared as the 'new songs' on 1996's 'Epiphany'. 'Dare You To Love Me' was produced by David Gamson, Andre Betts, Keith Crouch, and Arif Mardin. The project also includes contributions by Prince, Me'Shell Ndegeocello, Gerry DeVeaux and Rosie Gaines among others. 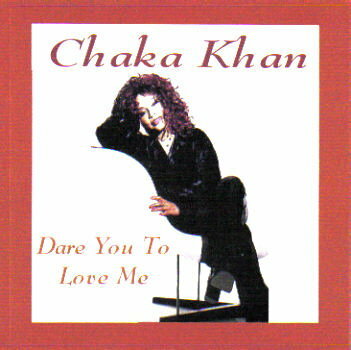 From what I've heard on the tracks that we've collected from the 'Dare You To Love Me' sessions (1993-1995), Chaka's exceptional album was dumped in favor of a 'Best Of' CD. If you have questions regarding Chaka Khan's 'lost album', feel free to contact us at chakasworld@hotmail.com. *NOTE - We had a struggle remastering (and cleaning!) the raw mp3 files for 'Let My Heart Go', 'Color Of A Dream I Had', and 'Whatever I Want' (courtesy of Serious Chakaholic Wallysong! ), but the work was well worth it! !